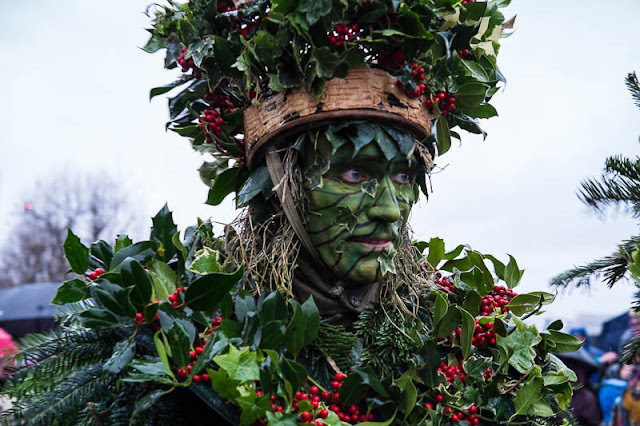 The Holly Man (the winter version of the Green Man) led the Mummers out of the Thames to perform their ancient pagan rites. (Or very entertaining plays). A rather entertaining folklore that attracted a group of hardy followers that weren't put off by the rain. This performance occurs every year on the twelve night so book it in for next year! Does it pre date Christianity? I hope he's got some thick clothing on underneath all that. You got a great shot of this character. I have never heard about this. Reading & following your blog is quite interesting, fun, and also a way to learn more about the big city. Oh, this is fascinating! I bet this is what Shakespeare's Twelfth Night is about, right? Makes me want to read it now. Wow - super shot, Mo! Oh dear, that poor guy, Holly has got to be the most uncomfortable choice of attire, ow! Great photo! Goodness - what a photo ! Wow. Beautiful costume and interesting folklore! This is a great costume and a great photograph of the costumed man.